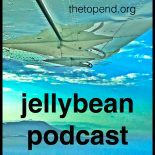 Medical Jellybeans with @TheTopEnd | Jellybeans. Conversations with Care. The Jellybeans started here and are now also hosted on lifeinthefastlane.com (The Original) & www.IntensiveCareNetwork.com This is the complete collection. Sometimes containing more controversial offerings. Jellybean 100 with Claire Kerr. A Change of Heart. Jellybean 89 with Dr Michelle Johnston, Doctor and Novelist. Jellybean 46 with Ruth Bird & thousands of football fans. This one is all about bodysuits. And risk. Bodysuits and risk! Anthony Tzannes spoke to the podcast in Cairns. His position is an interesting counterpoint to Di Stephens in Jellybean #16 Have a listen. Jellybean 14 with Tamara Hills. Jellybean 10.3 Yorkshires finest; Dr Alan Grayson. Jellybean 10.1 with Sarah Webb. Show some leadership! A great talk on nurses leading in hospital emergencies inspired me to catch this woman and ask her all about it. Excellent. Jellybean 10 with the Charming Tasmanian. Dr Brannigan. So why was it called beanboozled.wordpress.com? Where do you start something like SMACC? One of the stories behind the genesis of Jellybeanery.